Various people have theorized on Hogan’s Secret. Depending on the person and theory, Hogan’s Secret is any one of the following or a combination of some or all of them - weak left hand grip, laid off shaft at the top, how he slotted the club, right knee action, arms-shoulder-ribcage triangle, cutting it level left, wide stance with a squared right foot, weight transfer before start of downswing, the angled hinge, the waggle, pronation, supination, bent right elbow at impact, extra spike in the right shoe, et al. There have been other non-technical theories about the Secret such as Hogan's Zen-like concentration, course management and pre-tournament preparation. American Poet John Godfrey Saxe's (1816-1887) fable says that six blind men of Indostan were asked to determine what an elephant looked like by feeling different parts of the elephant's body. The blind man who feels the broad and sturdy side says the elephant is like a wall; the one who feels the tusk says the elephant is like a spear; the one who feels the squirming trunk says the elephant is like a snake; the one who feels the knee says the elephant is like a tree; the one who feels the ear says the elephant is like a fan; and the one who feels the swinging tail says the elephant is like a rope. Much like the fable of the Blind Men and the Elephant, the theories have been correct from a limited perspective, but none of them complete the jigsaw puzzle that is Hogan’s Secret. I must hasten to add that I mean no disrespect to anyone one who has dwelt at length upon Hogan’s secret and formulated a theory to explain it. Indeed, I have the highest respect for their knowledge, ability and love of the game. Almost all of them are certainly better golfers than me. I have studied all the technical possibilities listed above and I am elated to state that all of them fit neatly into the Big Picture. Sir Isaac Newton said that he could see further because he stood on the shoulders of giants like Galileo. Such has been my approach as well. Even so, I apologize and clarify in advance that I have no intention to disprove anybody. I am merely using the fable because it is relevant and fits into the context. We shall discover, as in the fable of the Blind Men and the Elephant, how all the theories on Hogan’s Secret are partially true. The reason they are telling it differently is because each of them has touched a different aspect of the Secret. When we see the Big Picture, we realize that the Secret has all the features that have been mentioned, and then some more. 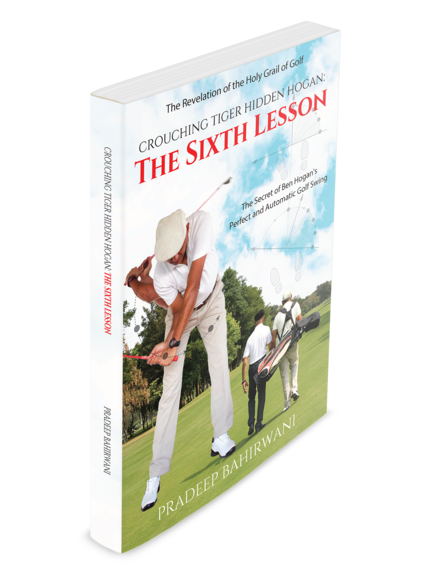 Crouching Tiger, Hidden Hogan: The Sixth Lesson is based on the only theory and physical model that corroborates all that the Master wrote and said and did. It is based on school-level principles of physics and geometry and a startling fact of human bio-mechanics never published before in any medical or golf journal. One has to do no more than a junior science experiment to validate it. A scaled down prototype of Henny Bogan - the Body Swing Golfing Machine - is also the basis of my patent application. With the Body Swing Golfing Machine, all the Master's five fundamentals fall neatly into place in the jigsaw puzzle. Plus it adds a completely new fundamental - the sixth fundamental - that is required to complete the puzzle. Hogan's Secret in one illustration. The Hogan Code arises directly out of the Master's Secret. 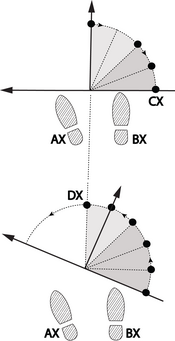 AX and BX are setup attributes of the left foot and right foot respectively. CX and DX are movement attributes of the backswing and forward swing respectively. The solid black dots are points in the circular path of the hands in the backswing and forward swing respectively. The darker shaded sections indicate dynamic plane shift.